In addition, the Council acts in a quasi-judicial role in hearing appeals regarding actions taken by a number of City agencies. 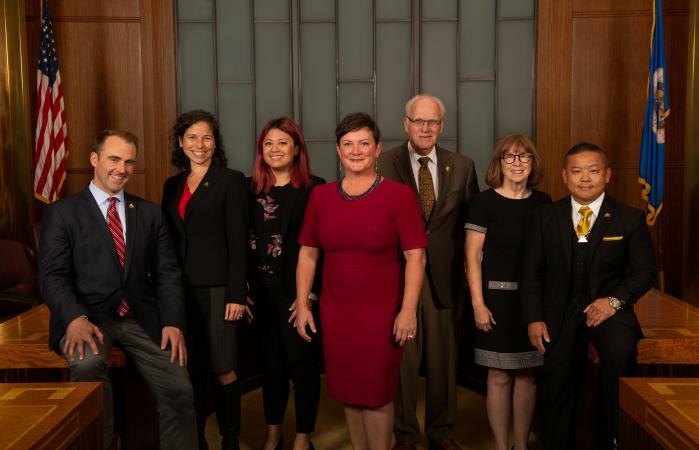 In addition to their duties as Councilmembers, the City Council serves as the Board of Health and as the directors for the Public Library Agency and commissioners for the Housing and Redevelopment Authority (HRA). Representatives from the Council are members of the boards for the Saint Paul RiverCentre Convention and Visitors Authority, the Saint Paul Port Authority, the Joint Property Tax Advisory Board (JPTAC), and the Board of Water Commissioners. Councilmembers are elected to a 4-year term. The current term runs through the end of 2019. All meetings are held in the Council Chambers of the Saint Paul City Hall and Ramsey County Courthouse, 300 City Hall, 15 Kellogg Boulevard., West. The public is welcome to attend meetings and can access meeting information on the Council's Meeting Calendar such as looking at meeting videos or looking up agendas, minutes, and documents. Saint Paul Channel 18 also broadcasts the meetings live and then replays are normally available on Thursdays at 5:00 PM and Saturdays and Sundays at 2:00 PM. Budget Review Committee periodically meets on Wednesday mornings, August through December. For additional information, please refer to the Budget and Property Tax Resources website. The Saint Paul Resident Guide provides information about frequently used city services. Please call 651-266-8989 for other information. Email Please note: your email will become part of the public record.